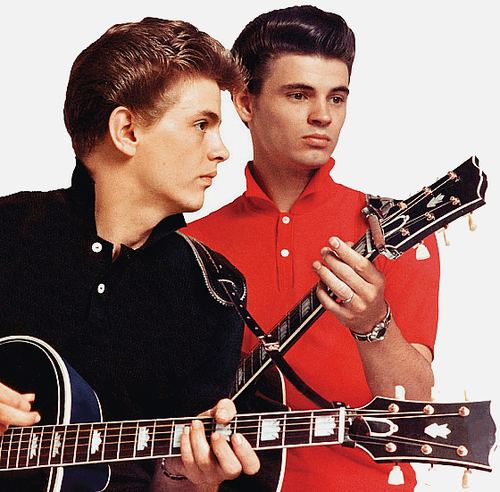 The talents of the Everly Brothers made them models for the next generation of rock vocal harmonies such as the Beatles, Simon and Garfunkel, and Linda Ronstadt. Friend and colleague Paul Simon spoke about the brothers, "Phil and Don were the most beautiful sounding duo I ever heard. Both voices pristine and soulful. The Everlys were there at the crossroads of country and R&B. They witnessed and were part of the birth of rock and roll." The fraternity value of love was shared in the words and soul of the Everly Brothers. During the 50s and 60s the brothers chartered hits onto the Billboard Hot 100 singles. Some of their hits include "Cathy's Clown", "Wake Up Little Susie", "Bye Bye Love", "When Will I Be Loved", and "All I do Is Dream". In an interview with Time Magazine in 1986 Phil spoke about his brother Don, "We're closer than most brothers. Harmony singing requires that you enlarge yourself, not use any kind of suppression. Harmony is the ultimate love." Phil Everly passes into the Chapter Eternal as a hall of fame musician, treasured icon, loved family man, and beloved brother on January 3rd, 2013.